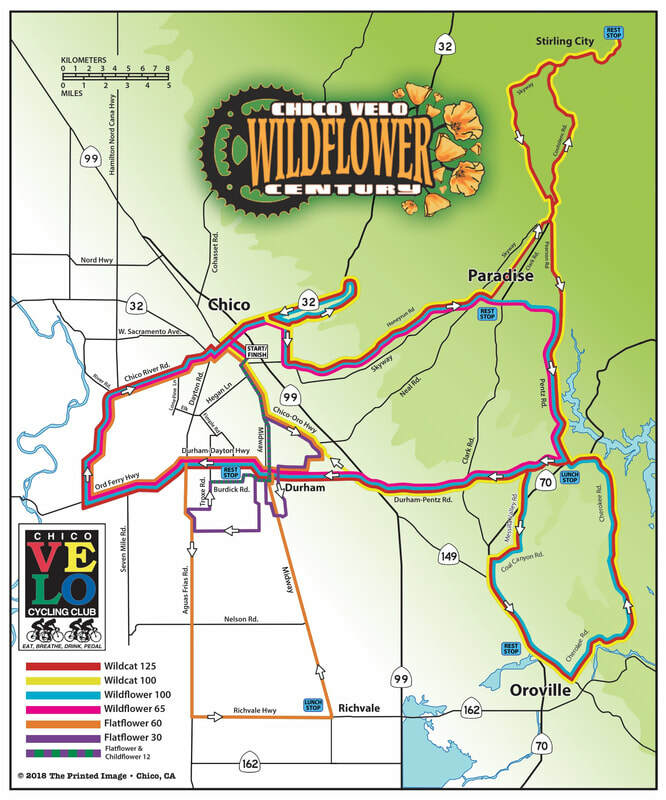 The Chico Velo Wildflower Century offers 7 different routes ranging from 12 miles to 125 miles giving riders of all ages and abilities and opportunity to experience the Wildflower. All routes begin and end at the Silverdoallar Fairgrounds in Chico, CA. No mater which route you chose, you are guaranteed to have a great time being a part of the Wildflower experience! Childflower 12 Riders! The registration price of $25 for the Childflower 12 is for 1 adult and 1 child. Each additional family member is only $10. A family member includes a parent/guardian or child. For example if you are a family of 4, you will register one adult and one child for $25, then each additional family member for $10. Your entire registration price will be $25+$10+$10 = $45 for all 4 participants. Every rider under 16 must have an adult accompany the rider on the Childflower. We do not have chaperones for this ride, just a ride leader who will be there to help support you and your family to and from Durham. Follow the BLUE route arrows! ​Follow the PINK route arrows! ​Follow the RED/Dark Orange route arrows! Follow the YELLOW route arrows! Follow the ORANGE route arrows! Follow the PURPLE route arrows! Follow the GREEN route arrows! NOTE: Route details and elevation data provided here are courtesy of RideWithGPS and are currently preliminary and unofficial; check back to download final maps for ride-day.